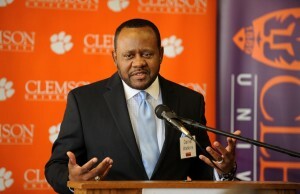 CLEMSON, S.C. — Clemson University’s Call Me MISTER program has received $1.3 million from the W.K. Kellogg Foundation of Battle Creek, Mich., to collaborate with Jackson State University to increase the number of African-American male teachers in Mississippi K-8 classrooms. Clemson’s Interim Provost Nadim Aziz made the announcement Friday as representatives from the three organizations gathered on the school’s campus in South Carolina to commemorate the collaboration and grant. “Call Me MISTER is a nationally acclaimed success story in education, and because of the W.K. Kellogg Foundation’s partnership, encouragement and investment, the program’s impact will grow even stronger as a catalyst for positive change, both in the lives of individuals and in the social and economic well-being of vulnerable communities,” Aziz said. Presently, JSU has 10 students enrolled in the program. Funds will be used for tuition, books, professional development and the summer leadership institute. “The Jackson State University family, led by President Carolyn W. Meyers and Academic Provost Dr. James C. Renick, is extremely grateful for the generosity of the W. K. Kellogg Foundation. We are proud to partner with Clemson University and the Call Me MISTER program,” said Daniel Watkins, dean of JSU’s College of Education and Human Development. “As the fiscal agent and collaborating partner on the W.K. Kellogg Foundation grant, Clemson University joined forces with Jackson State University in 2012 to begin building a pipeline of African-American male teachers to serve in Jackson, Mississippi public elementary schools,” said Roy Jones, executive director of Call Me MISTER. The pilot program there was funded by WKKF for $200,000 in 2012. Nearly 100 students are enrolled in the program in six additional states: Florida, Kentucky, Pennsylvania, Virginia, Mississippi and Georgia. This grant is part of Clemson University’s $1 billion The Will to Lead capital campaign to support faculty and students with scholarships, professorships, facilities and technology. Congratulations Dean Watkins on this important award!